Dipity do dah: Anyone for tea? I've been away again, sorry. The job change has not been as stressful as I thought it would be which makes everything so much easier. All of the other changes are still up in the air and so I am still taking things easy, or at least trying to. Little M, our neighbours girl, is two today and all girls need their own tea set. I saw a beautiful one, but being china I decided to go for the smaller plastic one. Well every tea set need it's own coasters and, in the spirit of taking it easy(! ), I decided yesterday to crochet some coasters for M.
Last weekend I had lots of free time and so started my starshine quilt from Justquiltin. I know that the pattern is no longer available but if the next one is like this it will be worth getting. I didn't cut one triangle! It took some time; the construction was so straightforward, so I'd say the time was probably more to do with the size; each block is approx. 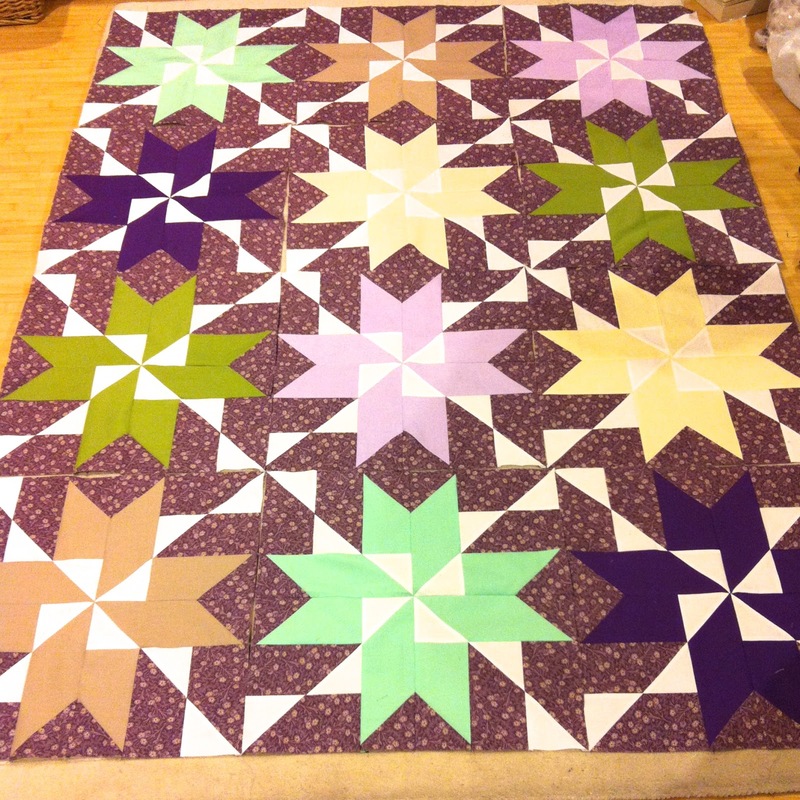 18 inches square. 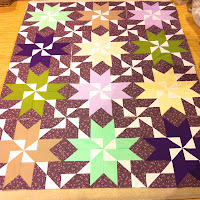 The 12 blocks still need to become 1 and then the border has to go on. I thought I could give it away but I don't think I can. Now I have 30 book covers and an Egyptian costume to complete by Thursday, all in the spirit of taking it easy!! I'm with you...keep it! It's beautiful! My, look at all those points. you're doing a beautiful job.